We are a world-leading basic and translational inflammatory sciences centre. The three major themes of our research - immunity and microbiome, inflammation biology and tissue remodelling and repair - are relevant for a diverse range of chronic inflammatory disorders, including arthritis, inflammatory bowel disease, tissue fibrosis and certain types of cancer. We apply state-of-the-art technologies in analysis of disease models and patient tissue samples to understand why disease develops and to reveal new diagnostic markers and targets for therapy. Strategic partnerships with nearby clinical centres such as the Nuffield Orthopaedic Centre and the John Radcliffe Hospital facilitate scientific translation from bench to bedside. 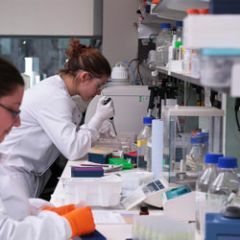 Our Centre for Osteoarthritis Pathogenesis Versus Arthritis aims to develop new treatments for arthritis, improving healthcare and transforming people's lives.